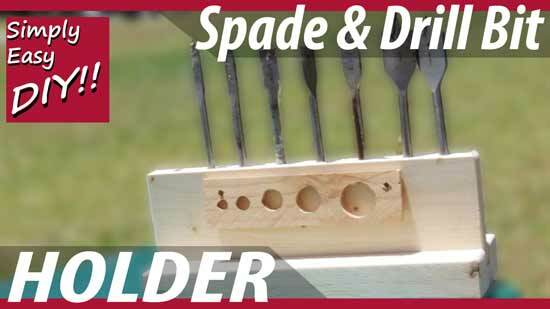 How to build a DIY drill bit or spade bit holder. Yep, that's simple and easy. A while back I built this handy dandy Magnetic drill bit holder for my shop. It helps me keep all my drill bits, spade bits, or any other bits I have in one easy to access place. However, there are times when I need multiple bits for a project or job that I'm working on. I'll grab a few that I think I might need and then realize I grabbed all the wrong sizes. Then I have to head back to the bit rack and grab one or two more. Perhaps it would be good to make something that I could put seven or eight different sizes and/or types of bits in and take the bit holder right to my work space. together in a drawer, then you know finding just the right size can be a bit frustrating. This is a simple and clever bit storage idea that allows you to take the part that holds the bits off of the base and out to your work area without scattering several bits all over your work table. It also will help keep you from having to make multiple trips back to your stationary drill bit holder for that one size you actually missed and needed on the job. It will help organize all your bits and your shop so you can find exactly what you need when you need it. Store router bits, drill bits, screwdrivers, awls, pencils and anything else you happen to make room for.